Yahoo! Today am going to "PONTENG" school. Going food hunting with the Best Food Guide ever. But before that, Mamarazzi had better clear off some backlog. Well, this is one of the backlog. While hunting for my shoes last December, we some how end up in Puchong. Noticed this special looking restaurant and decided to try out the food here. Papa and Mamarazzi love to have dinner with a pot of tea while I preferred Soya Bean. Roast Duck. Taste good but Mamarazzi still bias toward the one in Petaling street. Portion of Roast Chicken. Meat were tender and juicy. 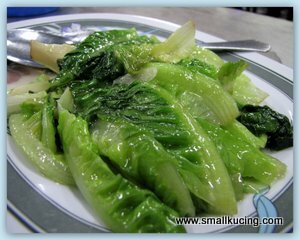 A plate of Yau Mak. Was a bit oily for Mamarazzi. 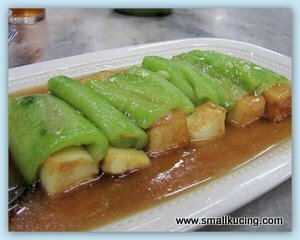 Angle Gourd with Tauhu. This dish was very delicious. Also the set comes with soup. Hmmm...okay la the soup. Papa ordered additional dish. 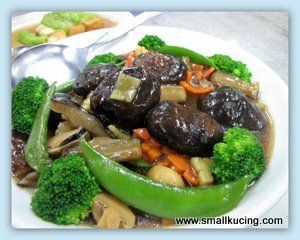 Sea cucumber with mushroom and broccoli. It was RM36 or RM38. Not sure. 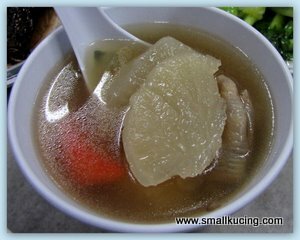 Taste okay but the portion of Sea cucumber was a bit small. I had a hearty dinner here. The Set Menu is certainly worth the price. That looks like a really good dinner! Is that a pterodactyl on the outside of the building? Yummm!!!! Yummmm!!!! 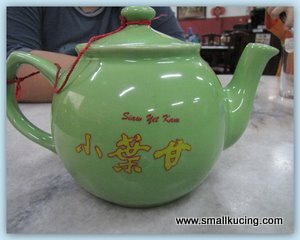 Starting this afternonn, the feasting begins...in Sibu! LOL!!! Hi SK, I sure love the dishes. The char siew looks delicious. That is my weakness. When I see, I get tempted to buy....and here so many varieties too, from all parts of China. eih, ok woh the set menu.. with that price got so many dishes.. and i can see the roast duck seems to taste good, but have not tried so cannot say whether PS one is better or not lah.. I think PJ also got one branch. 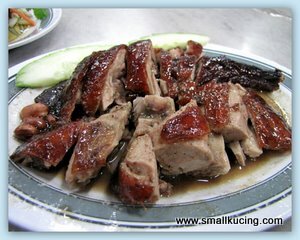 RM 29.90 can get duck & chicken, what a steal! hahaha... i think i also got to put up backlog posts while we are there! 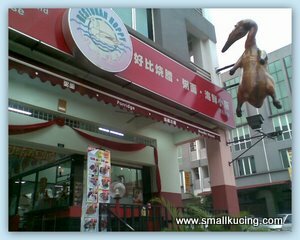 hahaha..
so long didn't eat the big duck liao.....maybe go this weekend...lol! The roast duck looks so yummy! 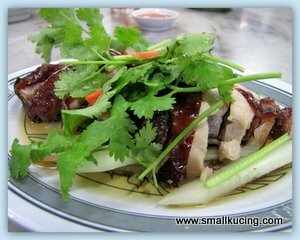 I think i will prefer to go with the Portion of Roast Chicken instead of the duck meat. And the Sea cucumber with mushroom and broccoli is my favorite.. Yes, it was. Worth it and taste good.